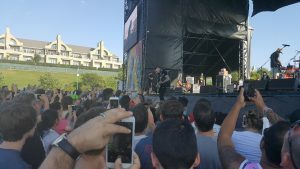 I started posting these on Facebook, and realized I was putting more into them than I initially thought, and then realized I was seeing a lot more bands than I initially anticipated, so I decided to go ahead and just do up a full post about all 25 bands I was fortunate to see at least parts of this weekend. I have attended every Beale Street Music Festival since 1998. I was 15 and I went to see Green Day that year. Since then, I’ve played the festival with my own band 3 times (2009, 2012, 2015), and have seen, literally, hundreds of amazing acts here, everything from Charlie Daniels to Limp Bizkit. 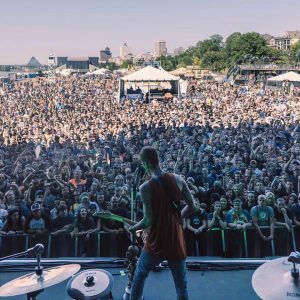 So let’s dive into the 2017 Memphis in May Beale Street Music Festival. Entertaining, for sure. Adam, the singer, is great at talking to the crowd, but he couldn’t sing that day to save his life. Still a fun set, and really big crowd for being so early. Absolutely amazing set by the 20+ year pop-punk-metal veterans. Stage energy and crowd participation was at a peak. There was not a single more energetic and fun set the entire night. If you’ve never seen them, make it a point to. Really strange, but incredibly fun dancy pop-rock act from San Francisco. They had a really eclectic set – the female & male singers were a great combination. They seemed to be the biggest buzz band of the night, and the size of their crowd definitely showed that. If you’ve ever seen this band once, then you’ve seen this exact show before. Nothing really new here. While a little bit boring, they are an extremely professional rock band, and the show was good. Their blend of 90s pop-rock still sounds fresh. Definitely the biggest crowd of the night. It seemed like 75% of the people in the park made their way to Snoop’s set by about 20 minutes in. He was definitely on top of his game. It’s not really a show – more like a party and Snoop Dogg is the host. He had no real stage production, but did have 2 backup dancers and a live band that was just killing it. The crowd ate up all of it. This was their first show in 2 and a half years… and I believe EVERYONE expected more. 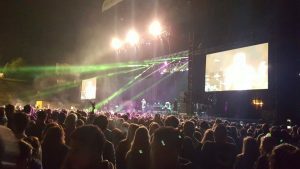 We left snoop a little bit early and ran into a massive crowd of people leaving MGMT’s set and heard complaints of it being ‘so damn boring.’ We saw it for ourselves, and they were right. The crowd was suuuuuper thin. I would imagine the only people left were the guys’ White Station high school classmates from back in the day. This was a flop, for sure. Decent crowd, good jams, same ol’ thing here. This dude’s voice is iconic, and he was in another dimension. The former J. Geils Band singer owned the stage, played killer songs, and the crowd ate it up. We got into the park later than anticipated, made our way to the River Stage, and caught the end of Deer Tick. That started the day off. Entertaining, for sure. This bunch was loud and was almost a little punk-ish. Not a huge crowd, but big enough to be a good time. I don’t know much about the band, but this was my 2nd time seeing them, and I’ve been pleasantly surprised both times. The absolute BEST performance of Day 2, in my opinion. You could tell it was going to be fun when the singer was onstage dabbing in a sun hat and a Mexican poncho, drinking a beer while the crew was still setting up. Their actual set was amazing. One of the few bands out nowadays that doesn’t use any tracks – it’s just the singer/guitar player, bass, and drums. Every song of theirs has a little bit different feel, but they all mesh so well into this bluesy garage rock. Almost Nirvana-ish. There were a ton of crowd surfers, the majority of the crowd was singing along… if they come back through, you HAVE to go see this band. Amazing live show and a lot of fun. We left the River Stage and headed to find food, so we stopped in front of the bud light stage and got a grilled cheese and a beer. Now, I’ve seen mutemath before, and this was one of the more boring performances by those guys, sadly. They are playing Shaky Beats in Atlanta this weekend, so their set was mostly electronic inspired, and way more soft pop than I remember them being. Small crowd, but I think the majority of the people in the park didn’t care about anyone at that time slot – everyone was getting beer and food and getting ready for the night caps. We wandered down to the FedEx Stage, on the south end of Tom Lee Park, and caught the final 45 minutes of Patterson Hood and the fellas. They’ve played Memphis so many times in the past, and considering they were the next to last act before Kings of Leon, their crowd was ridiculously large. It spanned from the stage almost all the way back to the blues shack. And they rocked. I’m not a fan of the political speak they’ve really been pushing with their newest music now, but the music is really good. I still think the Truckers would be a perfect addition to the Lucero block party one year soon. If you enjoy good songwriting and a lil alt-country rock n roll, this is your band. 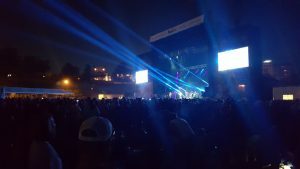 The Atlanta rapper, and last minute replacement after Ludacris canceled, brought a HUGE crowd for the start of his set, and the club crowd stayed for the whole thing… but the festival goers that were just curious (like us) didn’t stick around long. There was a DJ and 2 Chainz onstage, and no production. Basically, it was like they had a cd playing with somebody rapping over it. The mass of people quickly cut almost in half, but Chainz still had a dedicated group out there for him. We left after about 4 songs and headed to the River Stage. For those that don’t know, this is the band with the singles “Unsteady” and “Renegades,” which was a huge song thanks to the Jeep Renegade commercials a couple of years ago. We did notice at this point that a TON of people were actually leaving the park after 2 Chainz finished, which was surprising. 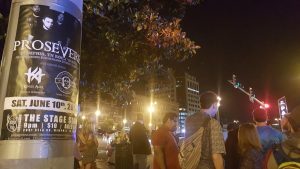 Probably should have expected it though – there weren’t any “party” acts headlining stages on Saturday night (no, Wiz Khalifa and 2 Chainz don’t draw the same crowd), so if people were wanting to party, they just headed to the clubs on Beale Street. We wandered over to catch the opening of Kings of Leon and, predictably, they had the biggest crowd of the night, and maybe the weekend. I’ve never been a huge fan of theirs, but I wanted to see at least some of the set. Chad Smith from the Red Hot Chili Peppers introduced the band, and that was about the height of my excitement. The set was pretty underwhelming. The sound was incredibly low, very little action onstage, and the stage production was boring. Just a video screen behind the band. This is a group that you really have to just love their music to appreciate the live set, and I just was not into them. I hear they played 20+ songs and had a really long set, and the other reviews I’ve read (from actual KoL fans) said they were great, so I’ll pass judgement to them. Of course, I also heard that they were filming a documentary from this show, so they had absolutely no interaction with the crowd. They just came out and played music. I don’t get it when bands do that. But hey… to each their own. We headed back towards the River Stage and stopped at the bud light stage to see a few songs from Wiz. I’ve seen him before and he doesn’t seem to disappoint the top 40 crowd. When we walked up, he was doing his own rendition, changing the lyrics to the Chainsmokers song ‘Closer,’ and the crowd was loving it. He had confetti and CO2 smoke cannons and 3 video screens onstage… He put on a great show, for sure. Kept his crowd entertained and invested, and has definitely evolved into an arena Top 40 act rather than just another rapper. We wanted to end the night on some mid-2000s emo/nerd rock, and the crowd for death cab was surprisingly as low as it was for MGMT on Friday. There’s not been a lot of buzz from dcfc for a while, and it showed. We did enjoy their set, but it was predictably boring – especially if you don’t know their music. You have to be in the right mood to enjoy these guys, and a Saturday night at a festival known for its parties didn’t really seem like the right fit. All in all, day 2 was a success. Huge crowds and great weather made for a fun night of walking and just enjoying music. The wife and I, and one of our good friends from St. Louis, met up at Aldo’s Pizza on Main St to grab a couple of slices and a drink before we headed down to the park. Great food over there, so if you haven’t gone, make sure you do at some point. The patio there is awesome. We leave Aldo’s around [3:15] and head into Tom Lee Park. There’s not a big line to get in on the north side (Beale St entrance), so we’re able to get in with no difficulties at all. Once we get in, we’re rushing to get to the south end of the park, to the FedEx Stage, to catch Machine Gun Kelly’s opening performance. 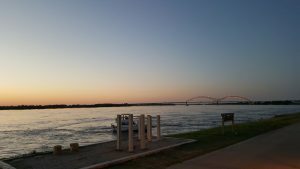 It was 75 degrees, not a cloud in the sky, and a nice breeze coming in off the river, and not nearly as windy as Saturday. MGK has sold out clubs in Memphis numerous times. He established himself as an underground success long before he started crossing his rap with Top 40 music and acting in big TV shows and movies. The PR team behind him is working magic right now, which is why it didn’t make much sense to have him on at [3:30] rather than later in the evening. Either way, his early afternoon set had a huge crowd, and that’s odd for the south end of the park that early on a Sunday. The performance was blistering, although he talked about having a chest fracture from about a week prior, but said he wasn’t getting off tour right now, since his record comes out on May 12th. People were eating it up, and I saw a ton of MGK merch around the park. Great starter for the 3rd day of the festival. Let me preface this by saying that this review will be totally biased. I’m a huge Alter Bridge fan. Have been since their album “Blackbird” came out back in 2007. This was the only “metalish” rock band that played over the entire weekend. Now, I can be a little bit objective and admit that their style of music gets musicians more giddy than just normal music fans. Comparing them to a band like Bush… Bush writes catchier, easier to digest music for the casual rock fan. Alter Bridge rips some crazy time signatures, vocal ranges that are harder to sing along with, and blistering super fast guitar solos. They don’t do a ton of crowd interaction, there’s not a lot of bouncing, or getting people to chant along with them. It’s just great music. But I’m a musician. And holy hell, for their first time in Memphis, they absolutely owned it. It’s just ridiculous how easily Myles Kennedy can hit notes in so many different octaves, and Mark Tremonti is still one of the best, most sure-handed guitarists in the world. It’s easy to understand why musicians flock to this band. They were on fire from the moment they stepped onstage, and you could obviously tell how professional they are about their job – which is playing music. They understood Memphis is not their biggest market, but they treated it like they were headliners. Fantastic set from these guys. I hope BSMF brings more bands like this in the future. Ziggy had one of the largest crowds of the day in his middle of the afternoon time-slot on the Bud Light stage (located in the middle of the park). Marley’s reggae tunes are the perfect backdrop for late afternoon, and people took advantage of the great weather and awesome vibes coming from that stage. There were plenty of smoke clouds rising from the crowd during his set, as you couldn’t walk but just a few feet through the crowd without smelling some of nature’s herb. Ziggy did what he always does, which is make people feel good. I only caught a little bit of Tori Kelly, as we walked down just to see what the crowd was like, and to see how attractive she was in person. She was definitely attractive, and her Top 40 pop music played well to the crowd before Jill Scott headlined her stage. Tori has a devote following in Memphis, as she sold out Minglewood Hall last year, and her fans definitely showed up to the festival for her. The sound was good, and you could hear everything that was going on. I could basically copy everything that I wrote about Ziggy Marley and just put it here. 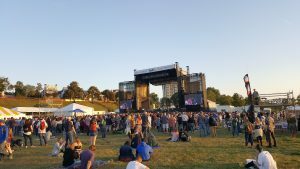 Again, we only caught a few songs of Ben Harper, but it was definitely good vibes and a great atmosphere as he played his brand of jam rock while the sun sank into the Mississippi River. 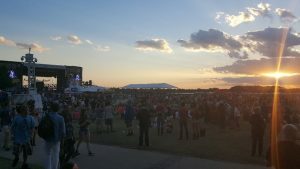 It’s always a surreal scene at sunset on the Sunday of Beale St Music Festival, and this was another great experience. Harper’s sound was great as well, and they definitely had a great crowd. I would wager that Bush had the biggest crowd of the day, as everyone started to position themselves to see Soundgarden at the end of the night. 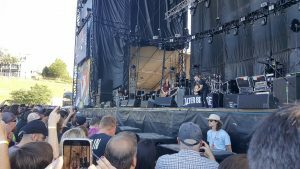 We’ve toured with Bush in the past, and they have about 15 singles they can play, so the crowd (even if they’re not big fans of the band) can sing along to basically every single song they play. Their light show was unreal – super bright, lasers and leds that pointed and bounced off the sky and into the crowd, but simple enough to not be too much. Made for some really cool lighting effects behind the band and made you not want to take your eyes off the stage. Their sound was perfect, as well. Sturgill came out with 3 other band members and himself. If you’d seen him on the Grammys or on Saturday Night Live a few months ago, you’d have seen him with a full brass section, etc. In this instance, he came out like a real old-school country act, playing his old-school electric guitar, and absolutely owning that stage. His raspy deep-south voice was such a perfect finale for this festival, which hardly ever caters to the country music crowd, as his music filled the Memphis night and sounded exactly like what you should be hearing in this part of the country at a diverse music festival. He was every bit as ruggedly entertaining as one might imagine, which was a little bit surprising, because acts that bring a lot of hype rarely ever live up to it. Sturgill Simpson definitely lived up to the hype. Without a doubt. Soundgarden broke up in 1997, and reunited in 2010, but have not played in Memphis since 1992, when they opened for Guns n Roses. So, of course, I had to stick around and see this band that I had been listening to since Badmotorfinger came out in 1991. Outshined, Jesus Christ Pose, Rusty Cage, and others were part of the soundtrack to my pre-teen years. 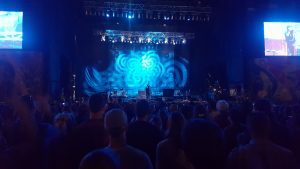 I had always been a big fan… but I went into this show with tempered expectations because I’ve seen Cornell acoustic, and I’ve read reviews of how underwhelming their live shows can be. All in all, the sound was good, and it was great to hear those songs live, even if they sounded a little off thanks to Cornell’s style of singing. We headed back to Beale Street to the car while “Fell on Black Days” faded into the background. 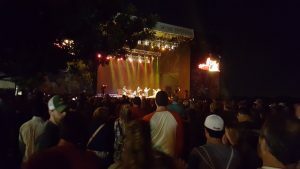 It was another great day of music, and the end of another great Beale Street Music Festival. The level of diversity in genres at this festival is unmatched at almost any other festival, and, personally, I’m glad we have something like this in our city.